Keith Haring, one of the biggest names in modern-day public art, once proclaimed that "art is for everybody." The idea of creating works of art that are accessible to everyone, not just the usual gallery-goers, has been gaining enormous popularity in recent years, and cities strive to freshen up public space with installations. What makes public art so popular? The answer is simple and complex at the same time. Public sculptures, murals, and multimedia installations encourage the community to explore public space and turn the streets into one huge gallery. Often, there’s also strong involvement from locals and the works have site-specific implications, underlining the uniqueness of the space. This interaction makes public pieces more attractive both for the inhabitants of the area and tourists. 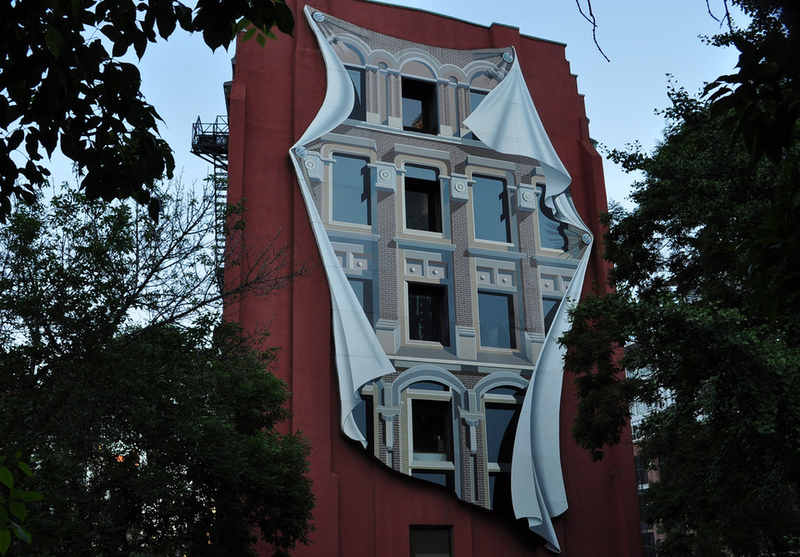 Let’s take a look at some of the most powerful pieces of contemporary public art in Canada. Commissioned for the Legacy Sites program, The Birds can be found in the Olympic Village in Southeast False Creek. 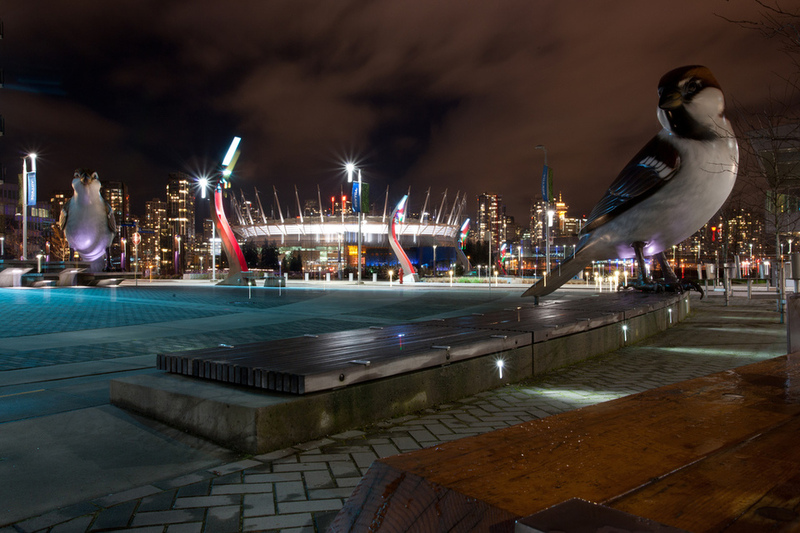 Ever since the opening of the area after the Winter Olympics, the public can enjoy two 5.5-metre-high, polystyrene foam and bronze sparrows standing at opposite edges along the False Creek Seawall. The main goal of the artist was to spark discussion about what is natural and what’s not and highlight the issue intruder species' impact on the environment. 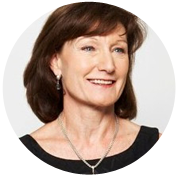 says Myfanwy Macleod, the author of the work. He further adds that the choice of sparrows was fully intentional. The sparrow is a typical city bird and it’s also fat and cute, underlining the irony of the work. 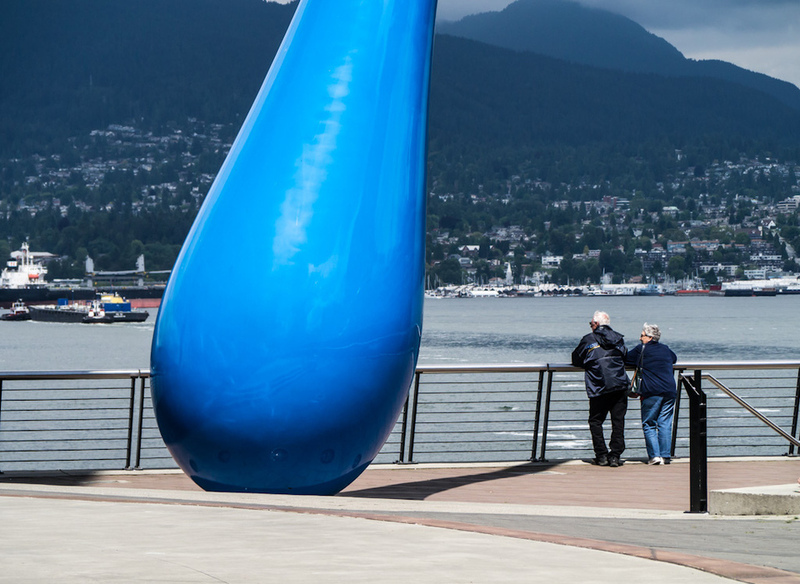 The Drop is a blue, 20-metre-tall, steel sculpture covered with styrofoam and polyurethane and resembling a large raindrop just a split second before splashing on the ground. 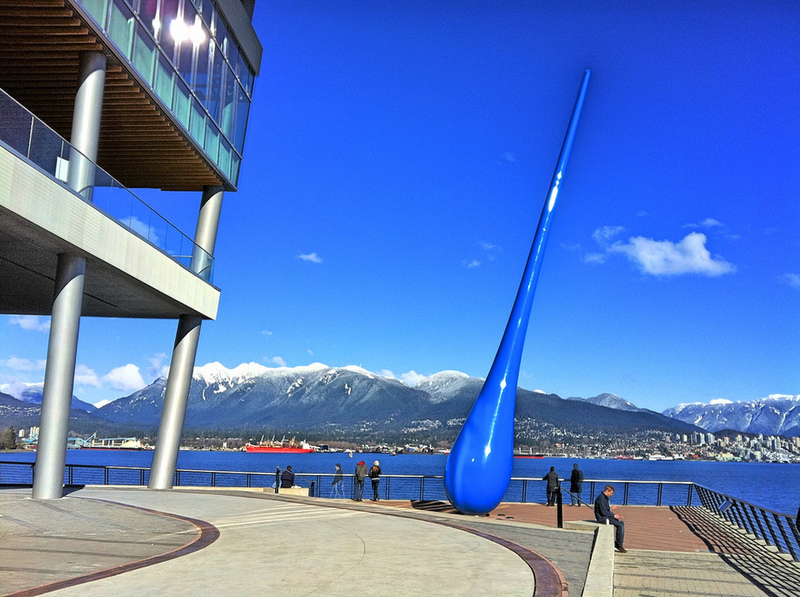 The work at Bon Voyage Plaza in Coal Harbour was created by the German artistic group Inges Idee, which specializes in art in public areas, as the group's first installation in North America. According to the artists, The Drop is homage to the power of the nature and reflects our relationship to the water that surrounds us. The statue had a great reception among the residents of Vancouver, who understood it as a playful inside joke (Vancouver is the third rainiest large city in Canada). Fun fact: The Drop was temporarily removed during the 2010 Winter Olympics, as it blocked the view of the television cameras. 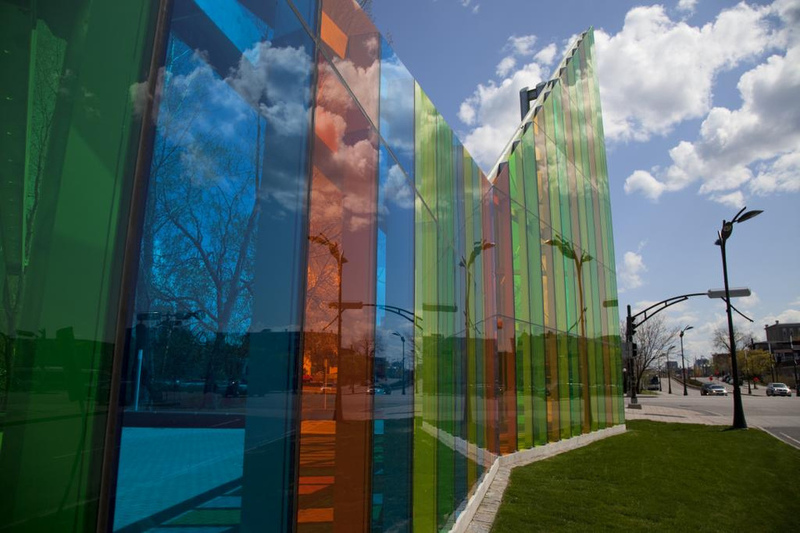 Papa, a giant enclosure made of multicoloured, transparent glass walls, can be found on Hull Island in Gatineau. Hal Ingberg, Montreal artist, architect, and author of the work, remarked that he aimed at creating two kinds of spatial experiences. For car drivers, the iconic beacon forms a symbolic gateway to Gatineau and welcomes visitors. From the perspective of the pedestrians passing by, it creates an intimate space of a tiny public plaza with a dream-like play of light that invites people to stop by and linger for a moment. Papa provides the most beautiful experience on a bright, sunny day, when the coloured light changes constantly and provides a tranquil yet dynamic spectacle. The work was unveiled in 2010 as the winner of a national competition. Maman is a 30-feet-high and 33-feet-wide sculpture resembling a giant spider with a sac containing 26 marble eggs. The work was created by the famous French artist Louise Bourgeois, a founder of the so-called Confessional art movement. In Maman, Bourgeois pays tribute to her own mother by using the metaphors of protection, strength, and weaving. The artist is even nicknamed "the Spiderwoman" due to her use of the spider theme. 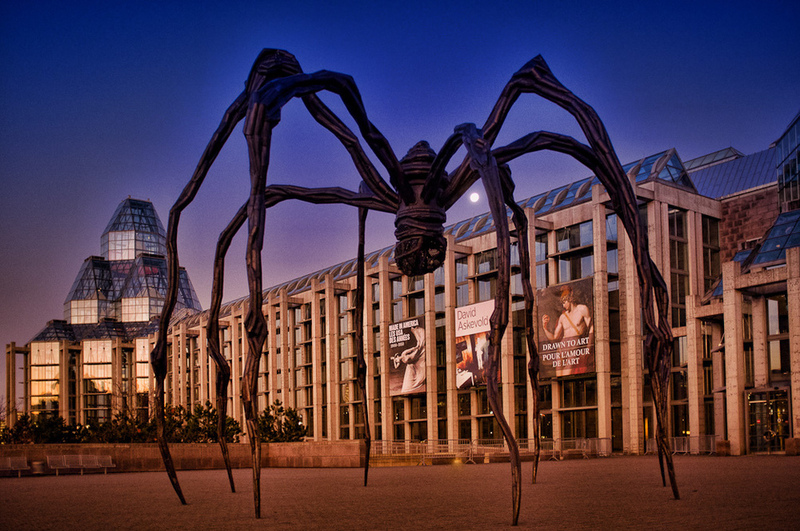 The National Gallery of Canada acquired Maman in 2005. At the time, some criticized its price ($3.2 million) for being way too high, as it used up about one-third of the institution's annual budget. Several other Maman sculptures can be found around the world, for example at the Guggenheim Museum in Bilbao (Spain), as well as in La Boca, Buenos Aires, and the Qatar National Convention Center. La Joute (the joust) was created by Jean-Paul Riopelle, a member of the Automatiste movement. The work includes a fountain in the middle of a group of bronze sculptures, together with animal and human creatures standing inside and outside the basin. 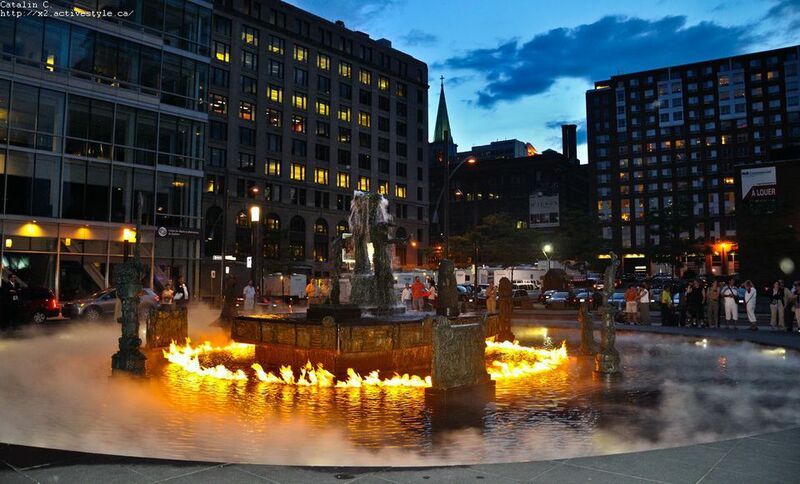 What makes the installation special is that it operates in 32-minute cycles that include such effects as artificial mist slowly turning into a dense cloud and jets of natural gas producing a spectacular ring of flame that's stopped by the water from the fountain after several minutes. This public sculptural installation was first unveiled in the Parc Olympique in 1969. However, it was later relocated to the Place Jean-Paul Riopelle, sparking a controversy, as some people argued the work lost its area context at the new place. At the moment, the fountain is being repaired and doesn’t function. Lisa Steele and Kim Tomczak worked together to create Toronto’s first multimedia public artwork located in Fort York. Watertable is the result of a competition from city hall that called for works that responded to the idea of the original shoreline. 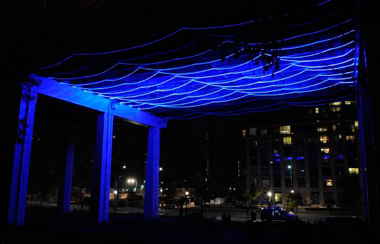 The duo of artists triumphed with their concept of transforming the underside of the Gardiner Expressway into a unique exhibition area that invites passers-by to enjoy the work all day and night. The current position of Watertable marks the water’s edge in the beginning of the 19th century and brings back the memory of the shore by emulating the sounds of the lake as well as its sparkling blue lights during the night. The installation was unveiled in 2009, but it’s been taken down at the moment due to repair work on the expressway. The artwork should be reinstalled in fall. Context is what is most important to me, rather than imposing one of my works onto a site. If there’s any great public art work that you like, let us know in the comments. We'll be happy to add it to the list!